Christopher Britton was born in London in 1953. At 14 he won a Junior Exhibition to study flute and bassoon at the Royal College of Music and went on to graduate in music and German at Birmingham University. After freelance flute-playing in BBC orchestras, which included regular broadcasts on Radio 3, he settled in Oxford in 1983, where he soon built up a substantial and successful flute and recorder teaching practice. In addition he has established a reputation as a virtuoso and highly versatile flautist, and has played with all the local professional orchestras and with very diverse chamber groups, such as the Pavlova Wind Quintet, the contemporary group The Oxford Players (TOP) and as a soloist. He is currently working on a recording of music by Bach for flute and guitar with Raymond Burley, and enjoys arranging music specifically for his wind quintet. Malcolm Pearce was born in Bournemouth and studied at King's College, London and the Royal College of Music where he won the Walford Davies prize for organ performance in his final year. He was Director of Music at Magdalen College School Oxford for many years, a post he recently relinquished in order to pursue a variety of musical projects. He has conducted various choral societies and orchestras and is in regular demand as a recitalist, accompanist, continuo player, and for directing workshops. He has a growing list of musical topics on which he lectures for local branches of the National Trust. As a composer, he is regularly commissioned and his compositions have been published, recorded and broadcast on Radio 3. Carolyn King was born in London and studied the oboe with Natalie James and Anthony Camden. She read biochemistry at Lady Margaret Hall, Oxford, and at University College, London. She completed several years of post-doctoral research in Oxford before relinquishing her scientific career to concentrate on music. She has subsequently built up a busy free-lance career both as an orchestral and solo player, and has toured extensively in Europe with the City of Oxford Orchestra where she was the principal oboe for many years. She is in great demand as a teacher in the region and is the founder of the New Oxford Ensemble and a member of the Pavlova Wind quintet. She is very interested in how dyslexia affects music sight-reading and has recently completed an MA at Reading University on this subject. 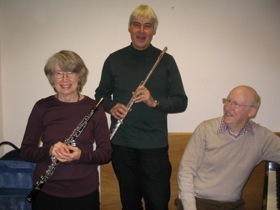 New Oxford Trio was formed specifically to give the first performance of 'Sundry Sketches' by Malcolm Pearce. The members are all part of the larger New Oxford Ensemble which was founded a few years ago to present new pieces - including compositions by young musicians for their GCSE and A Levels - and to give a platform to up-and-coming young performers. We are very pleased to be able to introduce the members of the Strathdee Music club to the music of a present day composer, as well as to some 18th century music by a couple of Scottish composers with whom they may not be acquainted.